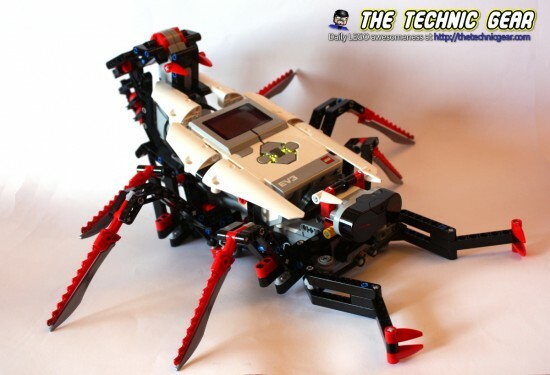 This first part of the robot is about building the ball shooter. 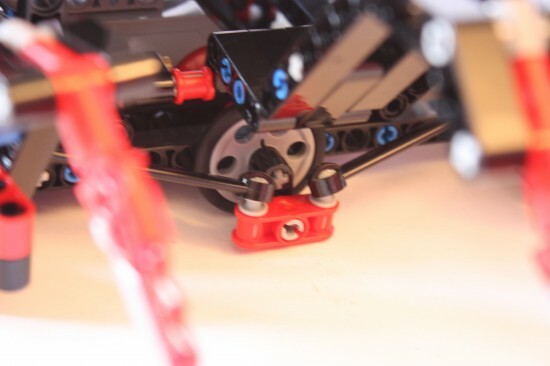 So basically it is a L-motor connected to the brick and with a similar part usage to the Track3r‘s ball shooter. The difference here is the clever way of attaching the ball shooter to the L-motor so it appears from the back of the robot and shoot a ball just to hide away again. Pretty clever and definitively quite good looking. The code is pretty straight forward. It is just moving back and forward the L-motor. Does it has balls? On my robot there was a position of the motor where the robot doesn’t shoot any ball and later shoot two balls on the same round. Check the video to see if the motor is attached correctly. I got this one too… you are steering the motor to the wrong side and/or too much. Have a look at the source code above and make sure you don’t steer the motor too much… you could end with a broken motor. See the above problem with not launching any ball, it is highly related. 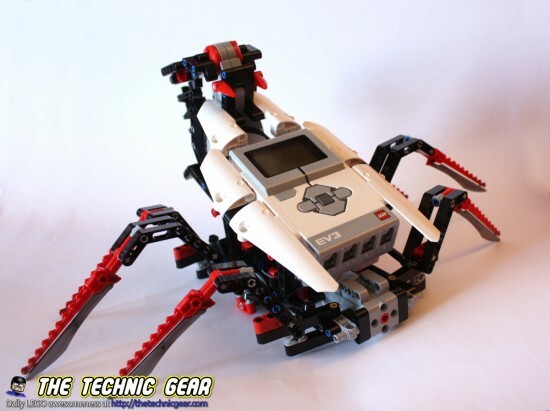 It is time to make Spik3r move so in this mission you will build the legs of the robot and motorize it. It is a quite interesting part, specially the part that makes the Spik3r turns as it is built using just one motor instead of two. But how is it possible?! Turning and moving with just one motor?! Exactly. If you have been a kid you may remember those cheap RC cars where you can turn the car going backwards. The car just a blocked wheel on the bottom that while the car moves forward stays straight but that once the car moves backward moves a little to the side and forces the car to turn. Well, this is the same principle here. Did you see? Quite clever. The main problem with this program is realizing about how the Spik3r is supposed to turn. Once you get it it is quite straight forward code. Is the motor plug? Are you sure you are moving the correct motor? Check what port are you using on the brick and to what port are you sending commands. This looks like a construction problem. Check the above photo to see how the flying wheel is supposed to look like. 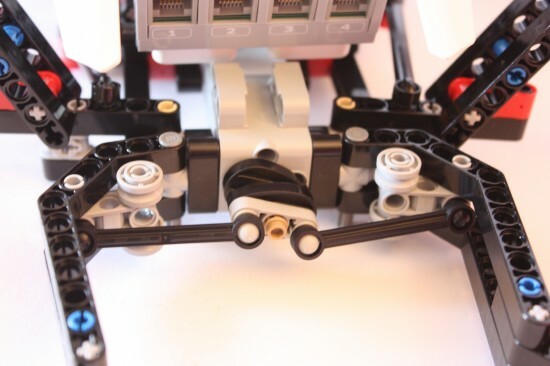 Check that the pegs are connected to the black links and that the red part that I don’t know its name is attached to the wheel. On my case after having the kid playing a bit with it, the part detached from the wheel and so this was the problem. Easy fix. Spik3r Mission 03 Crush It! 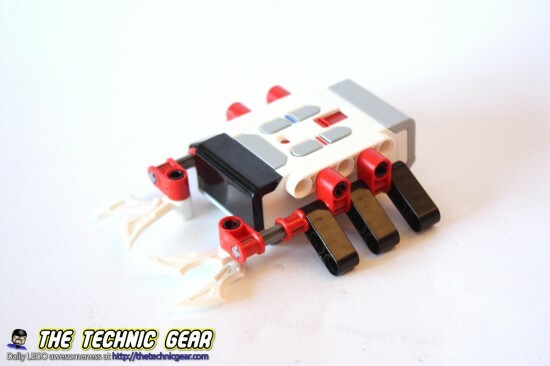 We are going to build now pair of claws that are attached on the front of our Spik3r robot and that are used to perform close range attacks . Boo! I prefer the Track3r’s Hammer, that’s really a good attack. Again, it is pretty straight forward. 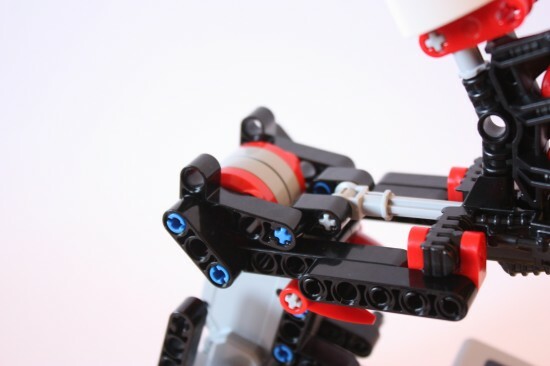 Just add to the mission 02 code the function to open and close claws. Is it correctly connected to the M-motor? Are you sending commands to the right port? In my case it wasn’t correctly connected. You need to plug the axle into the motor in the correct angle, please refer again to the building instructions. It is again another step over the previous mission. We add the IR Sensor that will be used to detect obstacles in front of our Spik3r. If anything is detected the robot will open and close its claws and finally will load the ball shooter and shoot one ball. After that, it will resume its patrol. 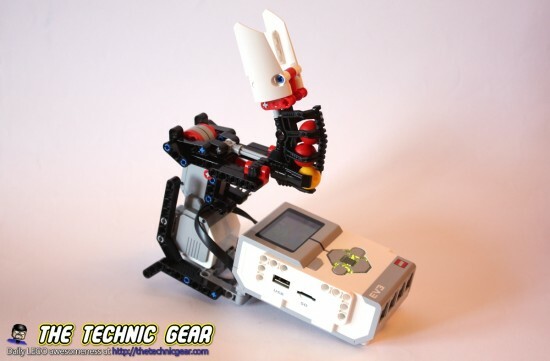 The program is getting bigger but still the idea is quite simple, just keep rotating until until something is closer than 40cm of our robot, then just run a sequence to open and close the claws and shoot a ball. The final step on the Spik3r robot is about using the other part of the IR control. If you notice it has a small button that turns the control into a IR beacon. Our Spik3r robot will patrol the area until it detects the beacon, then it will shoot a ball to it and finally will move forward to finish it up. Just remember to turn off the beacon after you stop playing with it or it will consume your batteries. Slightly more complex this time but not a big deal for someone like you. No idea why! In my case, it looks like the spider was well feed and didn’t want my bug :). Try facing it properly to the IR Sensor. So let’s me review this model. It is a nice building, quite big and quite impressive but it is a bit fragile, so take care if any child plays with it. – The missions are simple enough to be done on your own and the result is still pretty interesting. 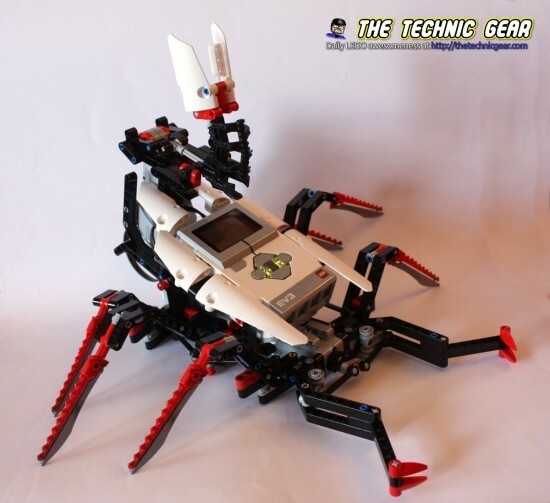 – The Spiker robot looks really spectacular. – It is easy to break a beam in the way legs works. – Sometimes it doesn’t easily find the beacon. Not on mine. Check that you are using the proper length axle. Umm… can you take a close up photo of the part? It sounds strange I remember having lots of problems with the sorting machine of NXT 2.0 when I placed a 7U axle instead of a 5U one… I realize quite late about the mistake. My SPIK3R won’t walk. Do you know what the problem might be? all has been followed , the wheels are turning, but does not touch the ground, so it does not ride in fact. Any idea what is wrong please ?